Are you experiencing neck pain? Let us help you. The two most common sites of spinal pain are the low back and the neck. One of the major reasons for this is that these areas of the spine are much more involved in movement than the middle of the spine. 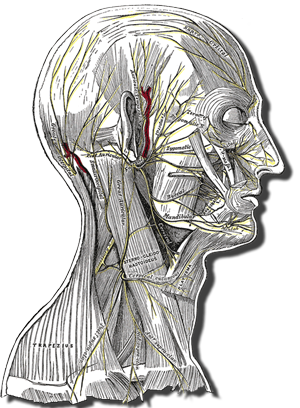 The nerves to the arms enter and exit the spine in the neck, while the nerves connecting the legs and brain pass through the lumbar spine. Although the neck is susceptible to direct physical injury (as in cases of whiplash), most cases of neck pain have no obvious cause. In fact they are commonly first noticed on waking from sleep. In order to understand why this is so, we will first look at the structure of the neck and then look at the effect of poor posture on the muscles and joints of the neck. Connecting the brain to the rest of the body by way of the nerves. Supporting the head is primarily a postural task. The muscles that hold the head up typically contract for long periods but only at a fraction of their maximal strength. Compare this to throwing a ball or a spear which use much more strength for short periods of time. The postural muscles of the neck are part of the muscle groups that extend from the head to the feet, bypassing the arms. There are four head to foot muscle groups. The muscles that extend down the front of the body share similar uses and the same fascial envelope or casing. This is called the 'front' myofascia ('myo-' means muscle.) Similarly there is a 'back' myofascia and a side or 'lateral' myofascia. The fourth head to foot muscle group, the 'deep' myofascia ('deep front' myofascia in Myers' terminology) has some unique characteristics. These characteristics go beyond the scope of the present discussion but are essential in the task of reconciling and integrating traditional Chinese medicine and science-driven Western medicine. The job of the postural neck muscles is to maintain and 'manage' the position of the head relative to the rest of the weight bearing structures of the body. These include the 'trunk' (sometimes called the torso, again see Wikipedia for more details) and the legs. 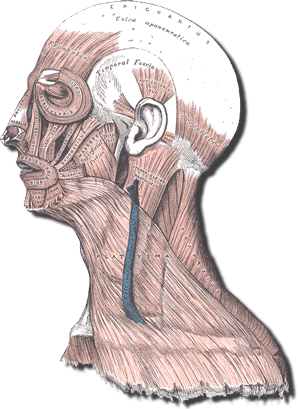 But the neck also provides the structural support for many (not all) of the muscles that move the arms. With the arms there are four muscle groupings. These are organized a little differently than those in the legs. They are organized according to whether they are superficial (closer to the surface) or deep and also whether they are on the front or back of the arms and torso. Here's the point. The muscle groups that move the arms, especially the back arm muscles, are not supposed to support the head. They need the head to be where it belongs already if they're to do their job properly. But if the postural muscles do not do their job and the head tilts forward, the back arm muscles that attach to the spine are recruited to help out. But it's too little to late. The head is already forward and the back arm muscles lack the proper leverage to correct this. They become overstretched and chronically overworked. As you can imagine, unless the postural muscles of the neck start to do their job, this condition gets worse not better. The pattern of deterioration can vary but in general it starts with muscle tension, fatigue and pain. It progresses to episodes of acute pain, loss of mobility. Because of the close relationship between the neck (cervical spine) and the nerves to the arms, asymmetrical muscle tension can lead to pain radiating down the arm or into the shoulder blade. The stress of chronic muscle tension, asymmetrical mobility and nerve irritation can lead to physical damage to the joint such as arthritis and disc degeneration. Because of the compromise of the muscles and nerves of the arm, conditions like rotator cuff and carpal tunnel syndromes can develop over time. Tension headaches can result from chronic muscle contraction. Even the chewing muscles can be affected because they belong to the deep muscle group and contribute to balancing the head and react to disturbances in that balance. Prolonged postural stress causing continuous muscle overwork can lead to irritaion and inflammation within and between myofascial groups. Chronic inflammation will lead to attempts by the body to fix the problem by laying down repair (i.e. scar) tissue. But if the postural imbalance (forward head position) is not addressed, the only solution is to bind together the irritated surfaces between the muscles. This leads either to decreased flexibility or increased irritation if you attempt to continue to use the affected muscles. Or both. Neck pain especially recurring or chronic pain is a serious condition. It is usually associated with forward tilting of the head. If uncorrected it leads to progressive pain and deterioration of the muscles and cervical spine. Correction will often require the help of a trained physician or therapist due to adhesions (scarring of the fascia) and compromised nerve function. If this applies to you, call 860-257-8388 for a consultation and thorough examination.